During the 8th grade, Knox offers a dynamic Confirmation Program from September through April. 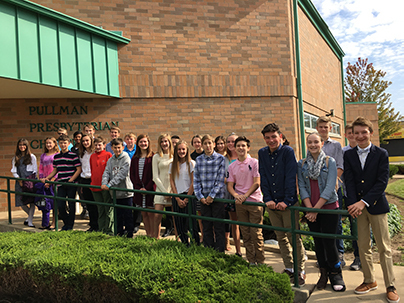 Confirmation is a time for 8th graders to learn more deeply what it means to be a Christian, and a member of the Presbyterian Church. We do this through classes, service projects, and large group discussions. Come join us on Wednesdays from 5:00-7:15 pm for our mid-week Christian Education program, a meaningful and fun experience for grades K-8! The kids enjoy getting together for Bible study, fellowship, recreation, crafts, mission work, and a family style dinner with friends. The programs runs from September through March. Each month Knox offers an event for youth in middle school to have fun and fellowship. On some recent outings we have played lazer tag, gone on scavenger hunts and jumped at Sky Zone. The kids favorite event is the lock-in where they get to spend the night in the church with tons of games and a fun bounce house! Knox Sunday School is a place for the children of our church and our community to learn to know God, to grow as beloved children of God, and to serve as valued members of the Body of Christ. Our curriculum emphasizes biblical teachings geared toward the tween audience.